Have you ever seen ripples and waves in someone’s carpet and wondered how on earth that happened? There’s a few reasons this might occur, there’s flood damage, damaged sub floor, but more often than not, the carpet was improperly installed by a contractor from not using a power stretcher. Not only are these ripples unattractive but over time they can become bigger, and dirtier and often become a tripping hazard. Let X-Treme carpet stretching save the day and quite possibly even prevent a lawsuit from happening, should someone trip and decide to sue you. 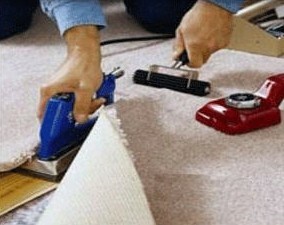 Seam Repair / Carpet Seaming X-Treme offers professional seam repair when your carpet seams are separating. We re-cut and redo seams as needed, often times even better than the original! Patches/Bonded Inserts Does your carpet have a spot that will not come clean? Or perhaps a carpet tear, burn or hole in it? Carpet patching is a less expensive, great alternative then replacing your carpet. Don’t worry, we can repair it!